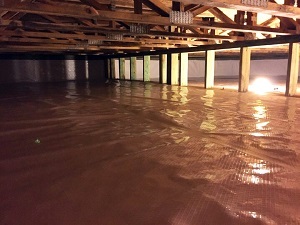 Our crawl space encapsulation system provides everything you need to create a dry, efficient space. Crawl spaces are frequently out of sight and out of mind for homeowners, but what happens in the crawl space can have a huge impact on your home. Crawl spaces can be breeding grounds for mold, pests, and odors, create home energy issues, and cause problems like sagging floors. If you're experiencing any of these issues, Clarke Basement Systems is here to help. We provide expert crawl space repair and encapsulation solutions that are designed to eliminate mold and water issues, improve your home's energy efficiency, and stabilize crawl space structural issues. Call us today at 1-844-225-6185 or click below to learn more about how we can help you upgrade your home! We offer free estimates on all our work in Vaughan, Markham, Mississauga and the nearby areas. Symptoms of a problem in your crawl space include leaks and standing water, mold or pests, musty odors, and sagging floors and rotting joists. If you've noticed any of these problems in your home, our complete crawl space repair system can help. Vapor barriers: Crawl spaces are naturally porous structures that allow water in through the walls and floor. Our CleanSpace® vapor barrier is the solution to this problem. This durable product allows us to seal off the entire crawl space and eliminate moisture from the outside. We also offer crawl space doors and vents to ensure a completely protected environment. Drainage & sump pumps: As part of our encapsulation system, we install crawl space drainage systems that will move any excess moisture out of the crawl space. 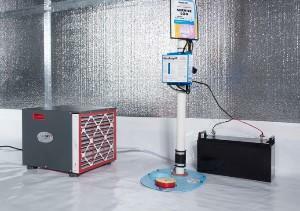 Our sump pump systems come with battery backups to ensure your crawl space is protected at all times. These systems will help protect you from leaks due to exterior water and plumbing issues. Thermal insulation: The crawl space is a common cause of energy waste in a home. Insulating the crawl space will prevent outside air from causing cold floors during the winter and creating humidity during the summer, helping to reduce your energy costs. Dehumidifiers: Crawl spaces are naturally humid environments, and excess moisture and building products is a recipe for mold growth. Our energy efficient, self-draining dehumidifiers help eliminate this humidity and prevent mold, mildew, and odors. Structural repairs: If your crawl space has been damaged over time, you may have noticed rotting joists or sagging floors above the crawl space. Our crawl space support jacks are designed to stabilize and support your floors, ensuring you don't have to deal with sagging or bouncy floors. "Did our homework and landed with a knowledgeable company..."
"Polite and helpful - every time." "Great job fixing my crawl space!" The CleanSpace® Crawl Space Encapsulation System can provide moisture control for any size crawl space. If you're having issues with your home's crawl space, Clarke Basement Systems are the local experts you need. As the local member of the international CleanSpace® network, we provide the highest quality crawl space repair and encapsulation products available. Our experienced professionals will ensure you get the right solutions for your home to ensure a dry, healthy crawl space. Call us today at 1-844-225-6185 or contact us online to learn more about how our crawl space encapsulation system can upgrade your home. We offer free estimates in Vaughan, Markham, Mississauga, Brampton, Vaughan, Oshawa, Richmond Hill, Barrie, Peterborough, Newmarket and throughout the surrounding areas.